From a robot’s point of view, the human body is a masterpiece: agile, dynamic and flexible yet strong and resilient. The body’s wounds can heal themselves and the skeleton—perfected over millions of years of evolution—allows the body to walk upright. Thanks to the complex interaction of muscles, tendons and joints, humans can do skillful and precise work using their hands, feet and limbs. Robots are still far from reaching this peak of evolution. But the Munich-based non-profit project Roboy has set itself the goal of developing a robot that resembles human capabilities as closely as possible. Roboy 2.0, which was presented in public for the first time at the Autodesk booth at Hannover Messe earlier this year, is an interdisciplinary research project with an ambitious agenda. At its current stage of development, Roboy 2.0 can already pedal a bike, recognize people and conduct simple conversations. Soon, he’ll be able to play the xylophone—a particularly complex task for robots due to the dynamics required. Next year, the team is planning to have him sell ice cream. By 2020, Roboy should be able to carry out basic medical diagnostics. All research is open source and creates essential basics in the fields of robotics, artificial intelligence and audiovisual data processing. The structure, weight and condition of all the robot’s bone-like components also play an important role in this context. Using innovative methods like 3D printing and generative design, the engineers are reproducing bones, muscles and tendons instead of simply replacing joints with motors, as it is usually the case in robot construction. For the development of Roboy 2.0, the team is using generative design technology in Autodesk Fusion 360, which will soon be available to all Fusion 360 commercial subscribers. By using a generative design process, the engineers managed to significantly reduce the weight of important robot components while maintaining stability. “If we save a few grams of weight in the robot hand, it reduces the forces on the hips — which means we can make them lighter,” says Hostettler. “In turn, this enables us to save weight on all other components, making Roboy even more agile.” Agility is crucial with Roboy’s goal of walk independently in the long run. A light yet stable stand is mandatory for his first steps. 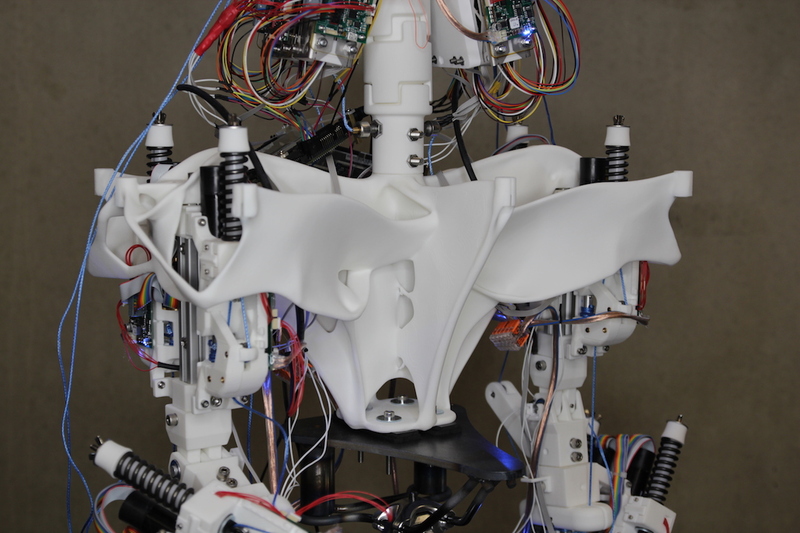 Currently, generative design is being used to construct Roboy 2.0’s pelvis. The researchers input Roboy’s physical design constraints such as weight, strength and connection points. Then thanks to the immense compute power of the cloud, the team settled on a pelvis structure and produced a first prototype in just three days. The next parts that will be revised through generative design are the head shell and the motor housing. Even the robot’s spine, with its many moving element, will be reimagined using generative design. Autodesk Fusion 360 serves as a design and working platform for the researchers, but it also enables them to collaborate across location and country boundaries. The software was developed as an agile working environment that allows researchers to more easily work in extremely short development cycles, or “sprints”. Older versions of designs and prototypes can be quickly restored or two options can be reviewed simultaneously. The researchers benefit from agile methods which establish a hierarchy-free communication and allow rapid interaction with prototypes. The individual project groups can thus react to changes very quickly. Another advantage of using Autodesk Fusion 360 is that the designs can be directly used for 3D printing. Designs can be prepped for printing in Fusion 360’s “Make” workspace and then sent directly to a machine for printing. Almost all parts of Roboy 2.0 are laser-sintered, i.e. 3D printed in plastic-like materials. The geometrical freedom of 3D printing allows the team to design components without having to consider manufacturing obstacles. The machine tool-free production also saves time and money. The team of over 100 students, doctoral candidates and graduates of the Technical University of Munich (TUM) brings together experts from a wide variety of disciplines. 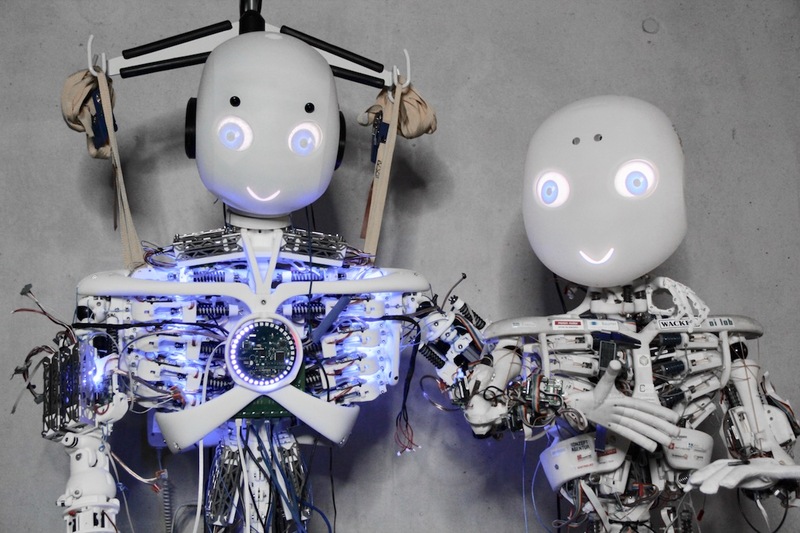 They have already been working on the development of the humanoid robot along with a network of scientists all over the world. Permanent cooperation partners include The Royal Institute of Technology in Stockholm (neuroprosthetics), the Chinese University of Hong Kong (algorithms for controlling the robot), Oxford University (loading of artificial tendons during their growth) and of course the TUM (robotics & real-time systems, product development methods). Roboy 2.0 is a fascinating example of humans’ entrepreneurial spirit. Although the robot is mainly used for fundamental research today, the knowledge gained during its development has already had an impact on numerous other sectors. The project is used in human-robot collaboration and is crucial for the development of innovative prostheses or exoskeletons. Neuroscientists use the knowledge gained in the Roboy 2.0 project to better understand how the human body coordinates the interaction of over 600 muscles. Can machine learning turn industrial robots into masters of assembly and construction?